The new year begins for India on a note of achievement as far as our international relations go and also significant success in checkmating the designs of an adversary next door — the Pak Army-ISI combine — who had been relentless in pursuing their proxy waragainst India using cross-border terrorism as its principal weapon. The present regime in India has been notably smooth in securing for the country a newfound recognition as a world power known to be actively contributing to global peace and economic advancement with a forthright approach of opting for bilateral relations based on mutual economic and security interests. Consolidation of our dealings with SAARC, growth of a strategic partnership with the US and Japan to work for the maritime freedom in the Indo- Pacific region and the security of the Indian Ocean in the backdrop of aggressive manoeuvres of China there and the convergence struck by India with the democratic world in general and US in particular against the rise of terror in the name of Islam, can be flagged as valuable upshots of Prime Minister Narendra Modi’s foreign and security policy. However, it is ironic though not surprising that even as India has been pretty successful in isolating Pakistan in the international community as the breeder of Islamic extremism and terror, the threats to India’s internal security have hardened at the turn of the year. There are three strategic paradigms that are creating a disquieting scenario for India for the period ahead. 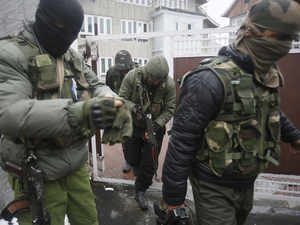 One is the ongoing challenge of cross-border terrorism in Kashmir that began in its current form in the early Nineties when Pakistan’s ISI, enthused by the credit it got for the success of the anti-Soviet armed campaign conducted on the war cry of Jehad in Afghanistan, planned to replicate the Afghan Jehad in Kashmir by pumping in Mujahideen into the Valley from across the LoC. This was the start of an irreversible process of subversion on the call of Jehad superseding the earlier political slogans of plebiscite and azadi. Jamaat-e-Islami Kashmir fronting the Hurriyat was soon to show up for what it really was — a bunch of Pak agents. And the Centre had to give up the earlier attempt at bringing the Hurriyat around by talking to them. The Valley-based political parties have copied the Hurriyat in not saying a word against the infiltration of terrorists by Pakistan and are now even upholding the locals who were recruited by the Pak ISI as terrorists specifically for the purpose of attacking our security forces. The policy of the Centre that talks with Pakistan cannot be resumed unless that country renounced cross-border terrorism stands fully vindicated. The Centre would be willing to talk to our own people in Kashmir who had all the freedom to criticise the former for any unfulfilled demands but the ‘fifth column’ on our side need not be treated with gloved hands any more. A second development that is aggravating the threat scenario for India is linked to the changing contours of the ‘war on terror’ which was essentially a deep-seated conflict between the US-led West and the Islamic radicals of Al Qaeda-Taliban axis unravelled by 9/11. Although India was ahead of Pakistan in coming on board with the US-led ‘world coalition’ against the new global terror, Pakistan stepped up its own proxy war against this country with the help of India-specific militant outfits under its control exploiting its leverage with the US as a ‘frontline ally’ in the ‘war on terror’. Years later it has come out that the Pakistan army was merely hoodwinking the US about fighting the Al Qaeda-Taliban combine which led President Donald Trump to suspend financial aid to Pakistan and put an end to his predecessor’s policy of making a distinction between ‘good terrorists’ and ‘bad terrorists’. With passage of time, the US realised that the ‘war on terror’ had failed to achieve its objective of getting the ‘moderates’ in the Muslim world to fight the Islamic radicals at home and pushing forth the cause of democracy there. Pakistan’s response to President Trump’s criticism for its failure to deny safe havens to terrorists on its soil was a recalcitrant public statement from Prime Minister Imran Khan to the effect that Pakistan had no business to fight the ‘American war’. Imran’s regime is a fig leaf for the Pak army whose agenda was served by the rise of Pakistan as the fulcrum of faith-based terror that found validation in the name of Jehad. Pakistan is determined to pursue its low cost option of destabilising Kashmir through terrorism — in 2018 the attempts to infiltrate militants under cover fire at the LoC doubled over those in the previous year. It will accelerate its efforts to recruit locals encouraged by the silence of parties in the Valley on the issue of cross-border terrorism. The J&K administration and police are still not doing enough to identify the ring leaders who were recruiting stone pelters and gunmen on behalf of Pak ISI. And finally, a new dimension of the covert offensive of Pakistan is its unabashed attempts to enlarge the Kashmir issue into a narrative of ‘mistreatment of the Muslim minority’ in India and join in the chorus of opposition here that harped on the sense of ‘insecurity’ allegedly prevailing in the community under the Modi regime. It is no surprise that Pakistan is fishing in the troubled waters of India’s domestic politics in the run-up to the general election. The national security concern in this is the likelihood of increased radicalisation and stepping up of the ISI’s operations for raising sleeper cells of terror in different parts of the country. The recent busting of a 10-member module spread across Delhi and Uttar Pradesh, whose handlers were in Pakistan, highlights this danger. There is also a likelihood of communal tensions brewing in the country in the post-election period regardless of the poll results and this will call for greater alertness on the part of local authorities. The security problem of India attributable to Pakistan cannot be dislinked from the China-Pak military alliance that now traverses the CPEC and finds reflection in the resolute opposition of China to the proposal of the UN Security Council to name Pak-based militant leaders as ‘international terrorists’, stance of China on Kashmir and the Chinese attempt to collude with Pakistan on the Afghan issue. Post-Doklam, China is consolidating the role of the Peoples Liberation Army across the LAC. Dealing with the Sino- Pak hostility on our borders and elsewhere in our neighbourhood remains a major focus of our national security strategy in the year ahead.